In a nutshell: Virtual family bank FamZoo is designed to foster healthy money management habits in a “hands-on” online atmosphere. Parents maintain total visibility and control as they teach their kids to earn, save and spend in a safe environment that aligns with their family values. If you’re a parent coming to our site, we know you’re not just seeking financial guidance for yourself. Developing your kids’ financial literacy is as important to you as protecting your own financial future. Taking on the responsibility of children means taking on the challenge of instilling in them smart money values. From saving to smart spending to giving back to the community, you want your kids to grow up with the confidence and understanding to make wise financial decisions. You want to engage your children with these valuable life lessons, but when and how? It doesn’t matter if you’re a single dad of two, a first-time mom, or you and your spouse have an established flock of four kids and counting; if you have kids, you’re busy. And what if you’re too embarrassed by your bad credit to try? 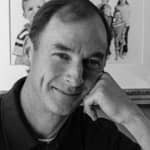 That’s why Bill Dwight set out to create FamZoo, the online virtual family bank that allows busy parents to teach their kids healthy money management habits through hands-on experience and incentives. Dwight realized there weren’t many options for helping kids learn to manage money through hands-on experience, and in fact, many of the teaching methods implemented by parents were disincentives for kids. This inspired Dwight to rethink the way we teach kids money matters. “What would it be like if someone created a bank designed for kids, exclusively to teach them good habits — not a bank to encourage them to spend, not a bank that basically profits when people screw up — and something that occurred in a time frame that kids could appreciate,” he said. 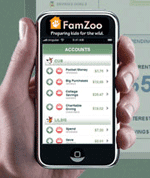 In 2006, FamZoo was born, and it’s grown from an original IOU ledger system to a multi-faceted resource for parents to monitor their kids’ saving, spending and development of healthy finance habits. Even if your own finance habits aren’t perfect, parents are still in the perfect position to be financial mentors for their children, even if they’re concerned with their own history of financial mistakes. FamZoo allows parents to help foster the right money mindsets, tie a positive association to saving and bring to light the negative burdens of debt, warning kids to avoid unnecessary financial risks that lead to financial crisis. 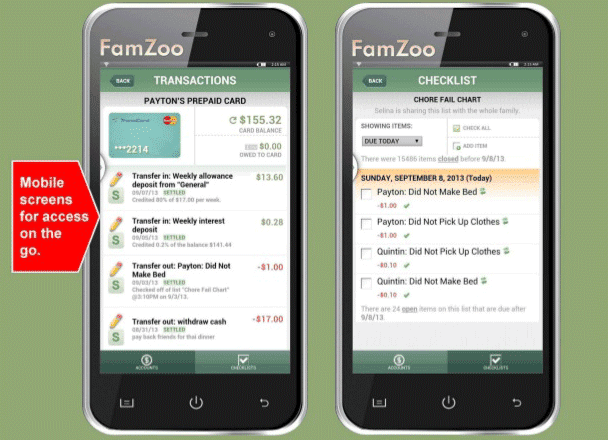 Original IOU Account Tracking: Mom and Dad manage the money, while FamZoo keeps track of the amount of money owed a child. It’s an accountability system for allowances and expenses, but the money is (hopefully) set aside elsewhere by parents. Prepaid Cards Account: Create accounts for your kids that are each backed by individual prepaid cards but are all linked together for your ease of access. All the money dedicated to the prepaid cards is FDIC insured. In an exclusive tutorial demonstration of the inner-workings of FamZoo, Dwight walked us through the unique features of this shared online dashboard. Each family is given a family sign-in name and each individual is given a member sign-in name. As the “bankers,” the parents maintain visibility and control with unlimited viewing of all family member accounts. The kids, or “customers,” can only view their accounts and card balances. Open up accounts that meet your individual children’s needs. For example, Dwight utilizes various features offered by FamZoo to cater to the life stages and interests of each of his kids. He is able to set up an automated allowance for his son, set up a spending account dedicated to clothing for his daughter and as an advanced user, he uses one of the IOU accounts to teach his youngest son about investing. The prepaid cards automatically capture transactions, and can be used anywhere MasterCard is accepted. This is incredibly useful, Dwight said, “because a lot of kids are doing things online.” However, purchase attempts that exceed the balance remaining on the card are automatically declined without overdraft fees. This family-oriented banking system capitalizes on the old ideologies of multi-slot piggy banks or the envelope system, but it’s entirely automated and done online. “We’re modelling a lot of the financial concepts that happen in the real world, but we’re putting the parent in control so that they can instill habits that are aligned with their values,” Dwight said. With FamZoo, you can set the interest rate you’d like to allocate to your child’s savings. It even offers a calculator tool to show “what kind of damage I’m in for,” Dwight explained, as well as a cap feature to allow you to motivate savings by setting an aggressive interest rate on any of the accounts. In addition to savings accounts, you may choose to create accounts dedicated to charitable giving or a savings account strictly reserved for emergencies. These cards stand out because they’re the only banking tool out there that will track debts between family members and reimburse owed funds automatically. You can train your kids to understand monthly bills, such as cell phone expenses. Even if they don’t have enough funds to cover the bill one month, as soon as the child does have enough money in the account, it’ll cover the deficit they owe the “bank” (or rather, their parents). “We’re basically automating and record-keeping a little family economy, if you will,” Dwight said. How can I start my own FamZoo? With a monthly fee, the cost of creating and managing your own automated family banking system is constant regardless of the number of cards you utilize. Monthly deals range from $5.99 for the whole family to the “best deal,” which is $60 for two years paid in advance. There are no other fees, excluding those when users access money via ATMs outside of FamZoo’s network, a one-time shipping fee of $2 for each card ordered beyond your fourth and foreign transaction fees. “Kids generally access everything from the Mobile UI,” said Dwight. Cards all support direct deposit, meaning teens and young adults can have their wages deposited directly to their accounts. 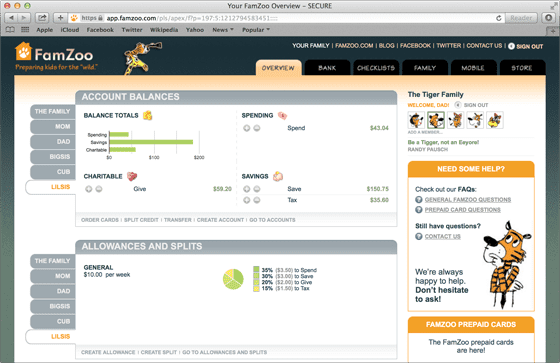 FamZoo offers a mobile app as well, so as your children grow, their bank matures with them. Kids can request additional funds, and parents will receive a text message notification with options to approve, partially approve or deny the request. Notifications may also be set up to alert the children of any other transactions on the card, such as interest, allowance, purchases and more. As part of the learning process, you can change your pin numbers and lock cards to give “financial time out,” said Dwight. “We want to strike this balance between keeping it simple and allowing families to take it wherever they need to and teach as many concepts as they want,” he said. To take charge of your children’s financial education through a dynamic, hands-on learning experience, check out FamZoo today.